As the guardian of the Basingstoke Canal, the Society promotes and campaigns for the sustainable future of the Canal as a navigation. Through the John Pinkerton Canal Cruises operation, it also raises money which is used to fund maintenance and improvement works undertaken by Society voluntary work parties. The Society was originally formed in 1966 to save the privately owned waterway, and campaigned for its restoration under public ownership. This was achieved in the early 1970s when Hampshire and Surrey County Councils purchased the then derelict canal. In partnership with the local authorities, the Society organised voluntary working parties, managed work training schemes and employed a full-time team to restore the Canal. After nearly 20 years effort, thirty two miles of the waterway, from the Wey Navigation junction to the Greywell Tunnel, were formally reopened in May 1991 by HRH The Duke of Kent. 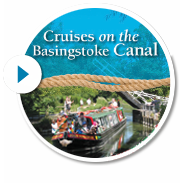 The Canal is now managed by the Basingstoke Canal Authority, and is financed by the two county council owners and neighbouring borough and district authorities, with a significant contribution of both cash and value-in-kind from the Society.